The beauty of your wedding is hidden in the small, stylish details. 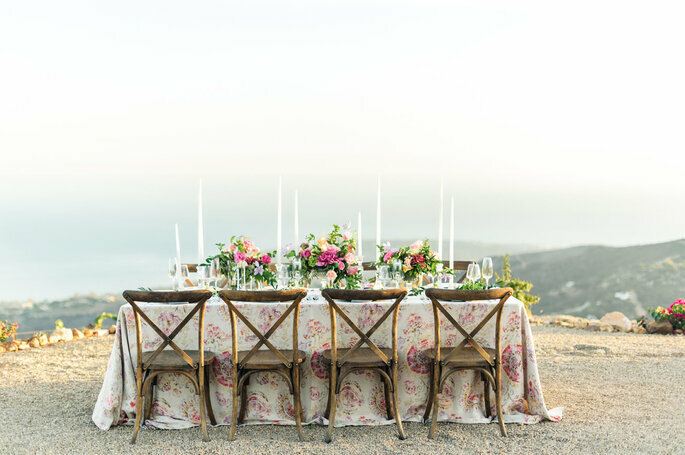 Let’s face it: a good 40% of the wedding takes place at the table, which features carefully placed decor, all coordinated with chairs, plates, glassware and cutlery like a work of art. That is why it is important to carefully choose the table decor for your wedding day. 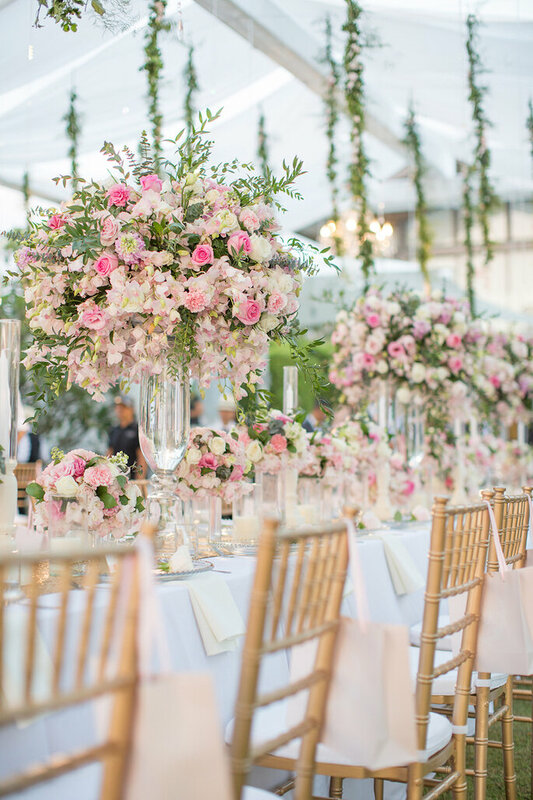 Here at Zankyou, we have gathered a list of the top five things to consider when choosing table decor, so, pay close attention to wow your guests with your choice of table decor. Whether round, square or banquet-style, your reception tables should complement your venue and get the styling they deserve. The style of table is of course selected depending on the number of guests attending – and as we know, Indian weddings are a grand event, and therefore large tables are required. They can, however be round, square or rectangle. Round tables are great for socialising and have conversational benefits, rectangular tables, on the other hand, are perfect for a more structured venue as they can be easily lined up in an orderly fashion. Top tip: Select the shape of table according to the venue size and shape in order to really maximise the space available. The colours and patterns used to decorate the table are what draws in your guests’ attention. Do not be afraid to use a splash of white, since, with it being a very versatile colour, white will always coordinate well with whatever colour scheme you choose. Include details of gold or silver to accentuate the main colours used, ensure they coincide with your outfit and general theme of the occasion. If you have flower decor, small elements of neutral metallic colours always look good! Whatever colour scheme and pattern you decide to go for, it will surely add a classy-chic touch to the tables with a feeling of freshness, order and sophistication to the entire reception. A common way to decorate is by using flowers. We recommend opting for roses, since they are available in a range of stunning colours in all different colours, from hot pinks to fiery reds. The flower decor becomes the focal point of the table, therefore it is important to select the right ones to perfectly fit your theme. 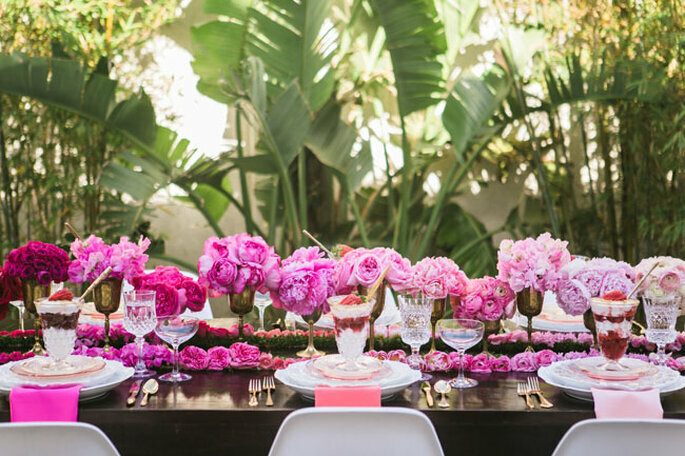 Often, the table decor acts as an accessory that compliments your dress, so ensure that your choice of flower decor does not overshadow the dress, but instead it accentuates and complements it. If you’ve fallen for the elegant style which originates from a banquet hall, then ladies we suggest you take full advantage of what is has to offer. Decorate well, using a range of different sized decor pieces; for example, use some small objects, such as a feature bouquet, mixed with tall taper candles to create dimension. For further effect, play with the shape of plates, perhaps opt for circular shaped plates as opposed to the standard square and accessorise with beautifully decorated pieces of cutlery. The sizes of the table can either remain consistent or differ. Using tables of the same size will create structure and formation, which is ideal for a small venue. 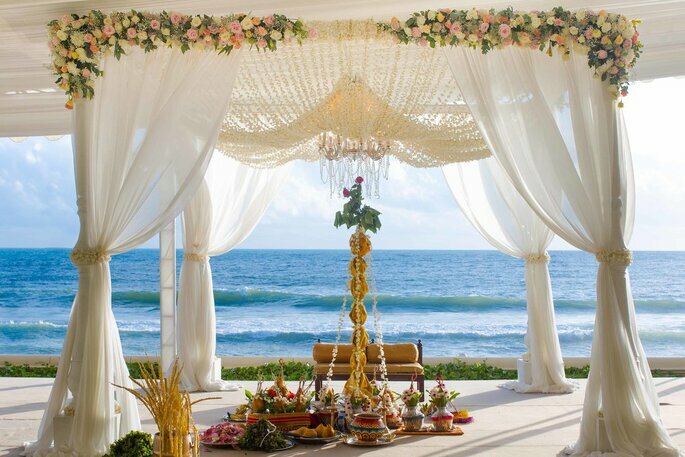 However if we consider Indian weddings and their grand nature, we recommend that you play with the sizes of the table, opting for a mixture of large and small ones, alternating perhaps between and a seventy-inch and a eighty-inch. So lovebirds, select carefully the style and type of table decor you would like to embellish your big day! Why not tag us in pictures of your wedding table decor, @zankyouindia.